Many of the reviewers of this adventure fantasy have said that it is like Watership Down, but with horses instead of rabbits. Watership Down tries to be as realistic as possible except for its intelligent, talking rabbits. The Heavenly Horse is much more fantastically complex, with its structured organization of equine herds into formal officers, the concepts of the Army of One Hundred and Five (a representative of each of the domesticated breeds of horses) who live in the horsey heaven known as the Courts of the Outermost West and the equine equivalents of Satan: the Dark Horse, his lieutenant, the fanged horse Anor the Destroyer, and the Soul Taker, who tempts horses into betraying themselves. 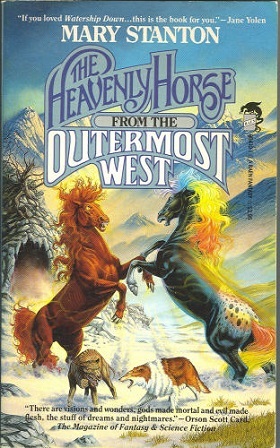 The Heavenly Horse from the Outermost West, by Mary Stanton, illustrated by Judith Mitchell, Riverdale, NY, Baen Books, June 1988, [4 +] 344 pages, 0-671-65410-1, paperback, $3.95. Piper at the Gate, by Mary Stanton, illustrated, Riverdale, NY, Baen Books, May 1989, [6 +] 306 [+ 2] pages, 0-671-69820-6, paperback, $3.50. "The Rainbow Horse exists," said El Arat, barely above a whisper. "He is all the colors splintered. Red, Green, Blue, and Violet." "I must get to the pond when the moon is rising. And you, Cory [the farm’s collie], shall help me." "We’re in the barn tonight," said Fancy. "We won’t be out for evening pasture until it’s too hot to be out during the day. You know that." "Cory will draw the bolt on my stall, and then open the gate to the duck pond," said El Arat. There was a very long silence. Finally, Fancy said, "This would be wrong, El Arat. There’s no reason for disobedience. The men here have kept their bargain with the horse. They create the breeds, and for that we serve them, nothing more. There is a Balance, just as the One has ordained. We are sheltered and fed, and in return, we bear our foals for them to train and sell. I can see no reason to break this bargain." "You can see no reason. I can. And I must get to the pond – tonight." "Why tonight?" asked Fancy. "And why the duck pond, of all places? The only reason you’d need the pond is if …" She broke off; a genuine horror shook her. "You can’t be serious!" "You must know, Cory, that we horses are part of the whole, just as you dogs are – one of many under the One Who Rules Us All." "Our own gods, the horse gods, are both good and evil – both kind and cruel. And, like many gods, your own, perhaps, among them, some are more one than the other. There is Equus, our good Lord, and his Army of One Hundred and Five, who live in the Courts of the Outermost West. Each stallion in the Army of One Hundred and Five is a Breedmaster; each a foundation sire for the breeds in the world of men. And the Army is ranked, as all herds are ranked – according to duty and function. The Breeds themselves are numbered: the oldest god is Equus the First. The Dancer, Breedmaster of the Appaloosa, is Second; El Hakimer, Breedmaser to the Arabians, is Third – and so on down to the youngest breed, the Palomino, One Hundred and Fifth." Well, I am going to have to discipline myself or I will end up quoting the entire novel. To summarize, Dutchess is the destined Breedmistress for the Appaloosa, the last true Appaloosa mare which has not had a Lead Mare since the last was killed in one of the wars of men. The Appaloosa breed is dying out. If Dutchess can be united with the Dancer, the breed will be saved. She is unaware of her own identity. Equus and the Dancer, watching from Heaven the Courts of the Outermost West, are aware of her, but they are helpless to intervene in her fate. The Black Horse, the equine Devil, is eager for her death which will render the Appaloosa breed extinct. The One Who Rules Us All has decreed that she must reach the Courts from the mundane world on her own, without interference from either Equus or the Black Horse. But the Black Horse has already tried to surreptitiously kill Dutchess, setting his Harrier Hounds (demonic reptilian equivalents of dogs) disguised as mortal dogs against her. This allows Equus and the Dancer to secretly help her in her travels to the Courts. Secretly? The Dancer wants to challenge the Black Horse’s second in command, Anor the Destroyer, the Executioner, a carnivorous horse “whose teeth, they say, are as sharp as a lion’s, who drinks blood and eats meat, whose hooves are like swords” (p. 29), to a fight to the death. But he can only help Dutchess secretly, by journeying to the mortal world and posing as a normal horse at Bishop Farm. He will lose his divinity and have to submit to the rule of men. He will become as vulnerable as any mortal horse, and they can be sure that the Black Horse will not miss this opportunity to try to kill him, too. What follows is an exciting and suspenseful adventure as Dutchess, so mistreated in her previous life that she is feral and lashes out at everyone, is surreptitiously guided from mortal horsehood to take her rightful place in the heavenly Courts. The Dancer carries out the first part of his assignment by becoming a mortal stallion and traveling to the Bishop Farm, but he cannot resist his stallion nature by escaping into the wilderness with Dutchess and Susie (a Paint) to start his own herd (joined by Cory as an honorary horse). This breaking of the Balance gives the Black Horse the power to send Anor and Scant after them. The Dancer’s tiny and fragile herd must face all the powers of the equine supernatural underworld. Kudos to artist Larry Elmore for his superb cover showing the battles between the demonic Anor the Destroyer and the Dancer; and between Scant, the leader of the “skull-headed, fire-eyed” (p. 29) Harrier Hounds, and Cory the collie. The Heavenly Horse has a happy ending, but Stanton followed it a year later with Piper at the Gate which continues the story. The Dancer and Dutchess have a strong, handsome foal, Piper, who grows up and is taken by Bishop Farm owner’s son David to start a new Appaloosa stud, Sweetwater Ranch, in Montana’s Big Sky country. Six years later, Piper has become Sweetwater’s Dancing Piper, the prize stud and Lead Stallion of its forty-strong herd. It is at this point that the Soul Taker, the equine female personification of evil, strikes again. Dutchess, Lead Mare at Bishop Farm, is tricked into killing herself, and the Dancer breaks out of his stall and disappears. When Emmanual Bishop comes to Sweetwater to visit his son, bringing Cory the Bishop Farm collie, the dog tells the Sweetwater animals what has happened; including that Dutchess and the Dancer are trapped between life and death. Lilly, now the Bishop herd’s Dreamspeaker, has had a Dream sent by Jehanna, the Dreamspeaker to the Army of One Hundred and Five. In the Dream relayed to Lilly, Dutchess and the Dancer are in great danger in the Havens, the equine Limbo. "She’s alive!" Piper said. "They’re both alive! But where are they?" Cory shook his head. "Lilly believes they are caught between the Courts above and the earth below. Dutchess is lost and must find her way out again. The Dancer is somewhere near her. Lilly knows that if she could reach them, she could lead Dutchess and the Dancer out." Cory dropped his ears. "She cannot leave Bishop Farm herself. She is old and has a nursing foal." Piper at the Gate is the story of Piper’s rescue of his parents and of his saving of the Appaloosa breed. 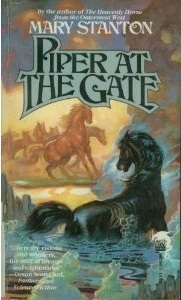 Main new characters include the many horses of Sweetwater Ranch, notably the geldings Duke, Blackjack, Hank, and Alvin who bicker but join Piper on his quest; Meg, the Ranch’s collie; and some enigmatic animals such as Shaker the horse and Dill and Basil the foxes who are manipulated into joining the quest – but whether by the Court or by the Soul Taker, not even they know. The minions of evil include the Black Horse, Anor the Destroyer, Scant and his Harrier Hounds, and the Soul Taker and her two daughters, El Mordant and Dreadlock. The conclusion is satisfactory, but not quite as clear-cut as in The Heavenly Horse. If Stanton was leaving herself an opening for a third novel, she never wrote it. Her many subsequent novels include other fantasies, mysteries both normal and paranormal, and the eight Unicorns of Balinor young adult novels. Both books are illustrated with pen-&-ink sketches of the main characters, apparently by the same artist although those in Piper at the Gate are uncredited. The latter contains a form to order sepia prints of the drawings, signed by the artist. Piper’s cover artist is Thomas Kidd. I don't know about horse breeds, but I can name the 8 most common breeds of pig: Berkshire, Chester White, Duroc, Hampshire, Landrace, Poland China, Spotted, Yorkshire! For the record, Chesters, Yorks and Landrace are "white" (or what people who haven't raised them would consider "pink") with Yorks having erect ears while Chester's flop; Landrace also have floppy ears, but they are huge ears, plus they have a distinctive "long" body. Hamps are black with a white "belt" around their shoulders and front legs; Poland China and Berkshire are black with five or six white spots. I get confused most about them; I can't remember which one had the floppy ears, and where the spots go (I think it's tail, feet and snout). Anyway, if the pig is white with black spots all over, well, you figure that one out, and Duroc are neither white nor black, but a distinctive red. I wrote an article here in April 2013 about the national Day of the Race Horse holiday in Turkmenistan, which practically worships the Akal-Teke horse breed. It's on the list of the 105. There wasn't much publicity for the Day of the Race Horse this April, maybe because the President of Turkmenistan fell off his horse last year -- right in front of all the spectators at the capital's main racetrack, although you may be sure that it wasn't even mentioned on the government-controlled news. Yarst! The weblink to horsebreedslist.com only lists 87 breeds, including the Akal-Teke and the Appaloosa. Have the other 18 become extinct since "The Heavenly Horse" was written? I basically stopped reading once "Equus" was called a god. Why not Epona? Did not do the research.